I don’t think pressure is something any runner enjoys feeling, especially when it leads to thoughts of failure. My entire running career, up until 1 year ago when I started to work with Rivs, was built upon pressure. Certainly that is not any reason to run, but it’s why I ran. Maybe it was something I concocted in my head, or hugely internal, but the pressure I felt to create magic, or win, was so intense, it almost beat me. I recall comments of “oh, you’re a runner?” to “I see you only won one of the two races this weekend, what happened?” to “how come you didn’t PR?” which lead to ridiculous feelings of anxiety and failure. 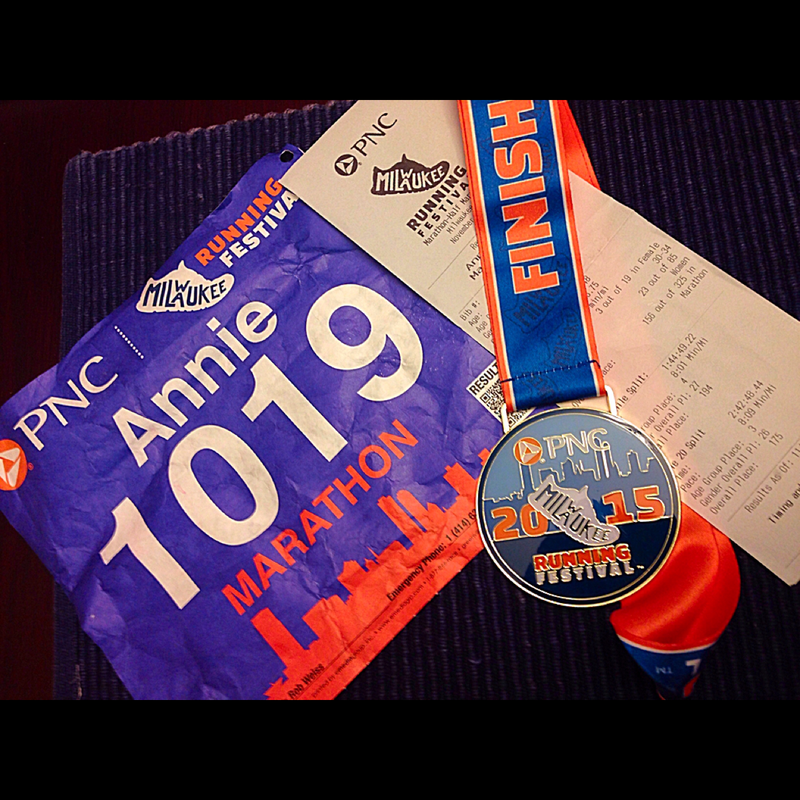 I recall DNF’ing one marathon so I wouldn’t have to explain why I didn’t race fast that day. I know I’m hard on myself and set the bar high, but my love of running and reaching beyond my limits was not my purpose anymore – it had morphed into running under pressure. I just simply wanted to enjoy running once in a while and for some reason didn’t think that would be acceptable. Not until this last year. We headed into the VIP tent where other runners, elite runners, and volunteers were prepping. It was a great perk given the wind off Lake Michigan. I wasn’t nervous, nor was I feeling heavy legs or any discomfort in my body. We set a goal of 3:20. I dunno – I haven’t run a road marathon in over 2 years – who knows what I can do out there?! It was a shot in the dark in terms of pace. My training the last year has been slow twitch fiber activation with 2-3 challenging speed/progression runs per week. I definitely have not been marathon training. The mileage for me is easy, it’s the faster paces now that will get me. The real goal was simply to enjoy the marathon miles together regardless of time. I was not allowed to freak out about results. I was ready to go. It was ridiculously hilly course, and I know all 3 or 4000 runners would agree! I think on any other course, the time goal wouldn’t have been an issue. The first 8 miles we settled into a comfy 730-750 pace. It felt great. When the hills and switchbacks against the wind started, pace slowed to 800-815 until the end. I didn’t mind the hills; I am conditioned for them, but holding a faster pace was not in the cards for me. It doesn’t fit my long-term goal right now. I know 100% Brian could have pushed a bit harder than I through miles 8-15 (my weakest miles typically in the marathon), but he stayed by my side – which meant the world to me. I suffered in those miles and I wish I knew why! I have yet to figure that out about myself. He told me stories about his college life and silly random things I can’t even recall. But it made a HUGE difference. Once the 16 mile marker appeared, I felt much better, and even better after mile 20. And even better than that by mile 26. We finished in 3:33 and we couldn’t have asked for a better experience together. It was an epic realization for me in the final miles. My race is not the marathon anymore – its everything that comes after mile 20 and beyond. It’s the 50+ milers and the test of limits. I pushed Brian hard in those last 6 miles as he was shutting down and I was turning on. The motivation of each other got us through, and even though pace did not change much, I could have continued another marathon after the finish picking people off. It felt amazing and simply one of the best feelings in my world right now with Championships quickly approaching. Rivs exact words…”Save that for NF!” And he’s absolutely right – I need to bottle up that feeling I had after mile 20 because that’s when it all begins in that race. The amount of pressure I feel at times and even with this training marathon does not compare to what I gained in the end. My coach is incredible and the training is spot on for MY goals. I forget too often that my goals belong to me and only me. My uphill battles are not so bad anymore – I can hammer the hills better than I ever have. I gained a bit of confidence in myself that I needed. Setting pride aside, and all that pressure I create or feel, was the best thing for me. An added bonus of course…not many people get to run side by side with their partner (AND enjoy it!) and that meant the world to me. There is so much more to my individual races, and that goes for every runner out there. What I gained from this race was not at all in the results. I have one (perhaps two) more training races coming this month as a means to continue prepping for Champs and building up the confidence in myself to create a different kind of magic – one that is not built upon pressure. I can’t wait to see what Rivs has in store for me! 😉 Cheers! Hydration/Nutrition: Orange Mud gear stocked with Gatorade in the first half, spark in the second half; VFuel gels – the best ever. No complaints here and completely dialed in. Racing Gear: Altra Olympus 1.5s…I can’t imagine using any other shoe on the trail, as well as the road at this point. They always hold up for me, and I’m still injury free! Swiftwick compression socks felt incredible out there. This was my first longer distance road race wearing them and they did make a huge difference in terms of achiness. No swelling after either! Their arm-warmers are pretty awesome as well, but 50 degrees in Milwaukee is a bit warm for them.